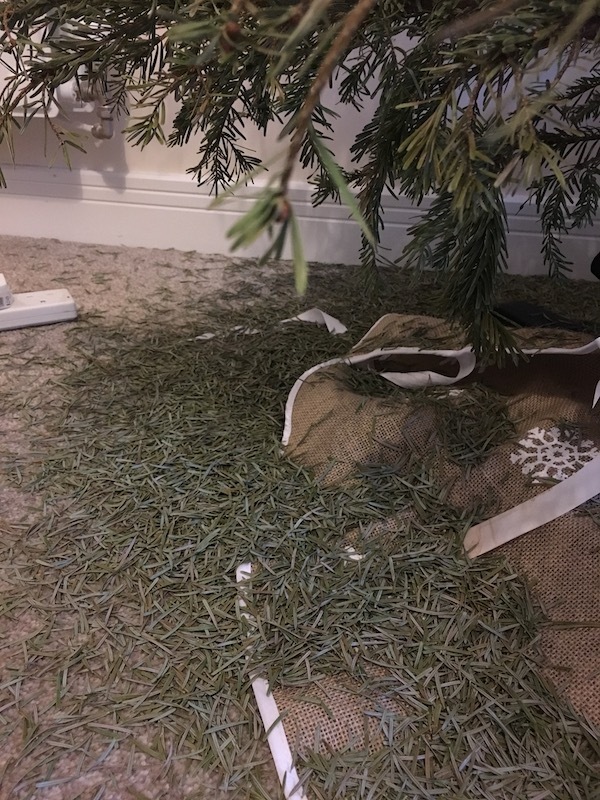 Well, regular readers will be delighted to know that our Christmas tree did indeed survive until Christmas Day (just), despite dropping approximately 3000 needles every half hour, along with whichever ornament it particularly wanted rid of at any given time. 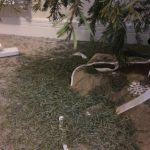 By Boxing Day, the dried-out old twig was clearly a fire risk, and so we packed up Christmas early. Taking the children to visit Father Christmas in his grotto. We may have overdone it with the Santa-based bribes with YoungestGirl. 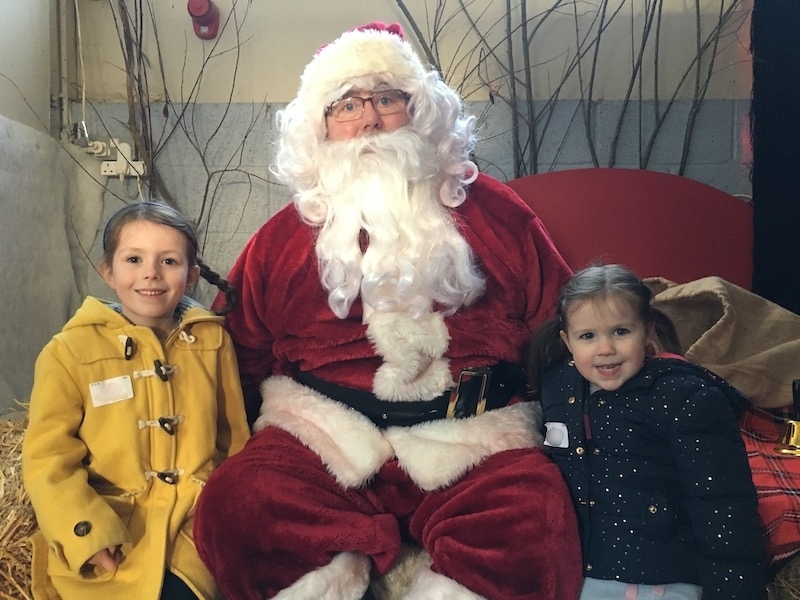 Upon visiting Santa in his magical grotto, he looked at the children and said to them, “Hello girls.” At this point YoungestGirl thought it necessary to educate Santa in exactly why she was a good girl. She waited for her moment, and then announced in her loudest, clearest voice, “SANTA, I DONE A POO IN THE TOILET.” If you have never seen a look of confusion and disgust on a Santa, I believe we have photographic evidence somewhere. Santa regrets his life choices. Day One of the holiday – I said to EldestGirl that she’d had a busy term and we could just chill out and watch TV all day. She retired to the playroom after breakfast, emerging an hour later at 8.30 a.m. to tell me she’d written two pages of her novel, done her piano practice, had finished learning her spellings, and could I please test her on her times tables. I just wanted to watch sodding Elf. YoungestGirl completely failing to embrace the joy of gift-giving on Christmas Day and almost having a tantrum when she had to give EldestGirl her gift. She finally handed it over to her sister with a meaningful warning shot: “Sharing is caring, EldestGirl!”. EldestGirl asking a lot of logistical questions about Christmas. She has twigged that the Santas in various grottos aren’t the “real” Santas. She also wanted to know why Santa couldn’t collect her presents for her grandparents (under our tree) and deliver them to Australia where Grandma and Grandad were staying. Thankfully the time difference worked in my favour here, and I explained that Santa would be going to Australia before he would arrive in the Home Counties, and besides which, he isn’t a bastarding Yodel driver. OH MY GOD WHY AREN’T YOU BACK AT SCHOOL YET? Still, it’s back to our usual routine now. Poo alert ahead – you can skip the next four paragraphs if you’re not interested in the finer details of potty training. If I weren’t the one writing this, I would absolutely be skipping it, so go ahead without censure. I can very tentatively say that I think YoungestGirl is finally potty trained. It’s true that she needs reminding to go to the toilet every hour or so, but is beginning to tell us when she needs to go too. She also refuses to poo, so you sort of just have to sit her on the toilet once a day and leave her there, moaning and complaining, but she generally gets the job done, so to speak. She had a dry day at nursery on Friday, so I’m counting that as a win. Eventually what worked for us (hesitant as ever to say that we’ve actually cracked it) was buying a toy she really wanted, and putting it on a high shelf until she did her poo in the toilet. As soon as she pooed in her pants again (I won’t call it “an accident” because it was totally deliberate), the toy went back on the high shelf, and she could only earn it back by using the toilet for the next time. As the novelty of this toy wore off, we bought her a much smaller gift (a bicycle bell in this case which was intended to be a stocking filler at Christmas but arrived too late). This is now on the shelf until she has done five poos in the toilet. She has a star chart for this. She is beginning to have some dry nights too, so I think we may be getting there. It has been incredibly hard. Other than breastfeeding, it’s probably the part of parenting I’ve found most frustrating and soul-destroying. At the time, potty training felt like hard work with EldestGirl, but retrospectively, she got the hang of it pretty quickly. We’ve been trying this with YoungestGirl tentatively for about a year, and actively for more than two months with only tiny progress steps. All children are different. YoungestGirl is already reading full sentences, so she’s not behind the curve in other ways… just found this particular thing difficult to master. Anyway, onwards and upwards. Potty training for YoungestGirl this week – a few of the easier Chopin Preludes next week perhaps. Or maybe some gentle Mozart to start her off. Nah, I’ll settle for continued announcing to everyone around her, “I DONE MY POOS IN THE TOILET.” It’s totally worth it. It looks like a health and safety advert and must have been a fire risk too? I think unfortunately that most trees do drop their needles. Had I made a fuss and taken it back in the first few days, I could probably have got a new tree, but I couldn’t be bothered to take all the decorations off and drive for 30 minutes just to go through it all again! Vary funny Nunn the Wiser. We call our Cliona Eldest Child ( well Steve does) -the other two are ‘The Boy’ and ‘Squg’ -the nick names have stuck with them into their 20’s! Thank you! Whether I can convince TheBloke (TM) that we should get a real tree for next year too remains to be seen. I might just sneak off and buy one like I did this year. But I will definitely be looking for a non-drop one next year!